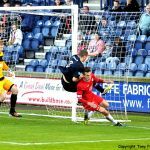 Raith Rovers ended Partick Thistle’s 100% record but Thistle remained unbeaten in the league after a last-minute equaliser at Stark’s Park today. Raith made one change from the midweek encounter against Celtic, David Smith coming in for Joe Hamill, who dropped to the bench. 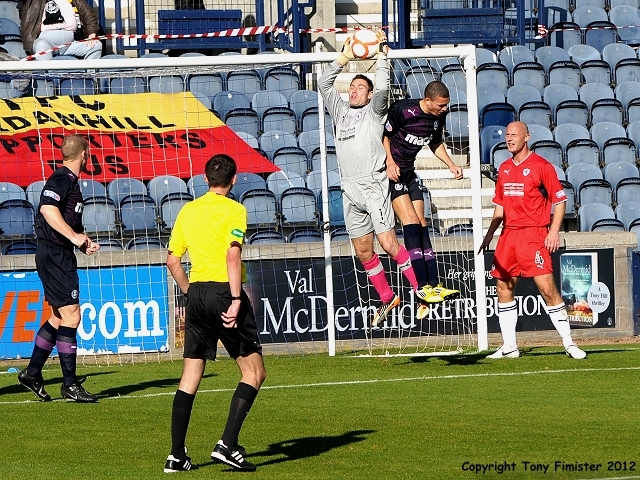 Thistle retained the same side that overcame Cowdenbeath in their last fixture. 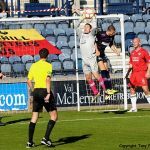 Thistle have been rightly praised for their start to the season, not only due to their results but also because of their performances, and it was easy to see why in the opening stages. Chris Erskine in particular was proving to be a handful to the home defence, looking to come in from the left with the ball at every available opportunity to run at the Raith back four. 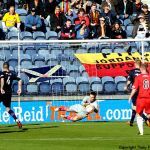 The pace of Partick’s attacks seemed to unsettle the home side and their defence in particular seemed hesitant, with several examples of indecision being spotted in the opening stages. It was from such a mistake that Raith picked up their first booking, Mensing giving the ball away just inside his own half and then pulling his opponent down when the break looked on. 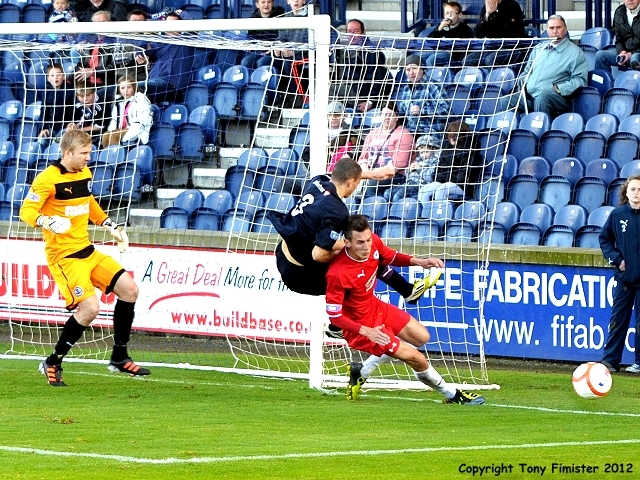 From Paul Paton’s free kick Aaron Sinclair found himself in space but his downward header was straight at McGurn. The opening 20 minutes was pretty much one way traffic with Partick’s full backs O’Donnell and especially Sinclair quick to break forward to offer support to the front men. Most of their attacks were coming from their left hand side with Erskine, Sinclair and Bannigan all combining well. While the football was great to watch and producing some dangerous whipped in crosses it wasn’t creating much in terms of clear-cut chances although Paton should have done better when presented with a chance after 20 minutes, his finish from 6 yards ending up straight at McGurn. 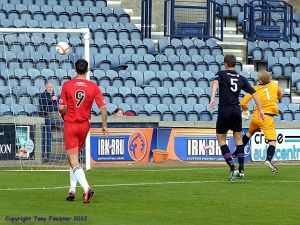 Despite being under the cosh Raith almost opened the scoring with their first real attack, Grant Anderson was allowed space to turn from 2o yards out but his good drive was fumbled unconvincingly around the post by Fox. From Walker’s corner, Hill headed over the bar. 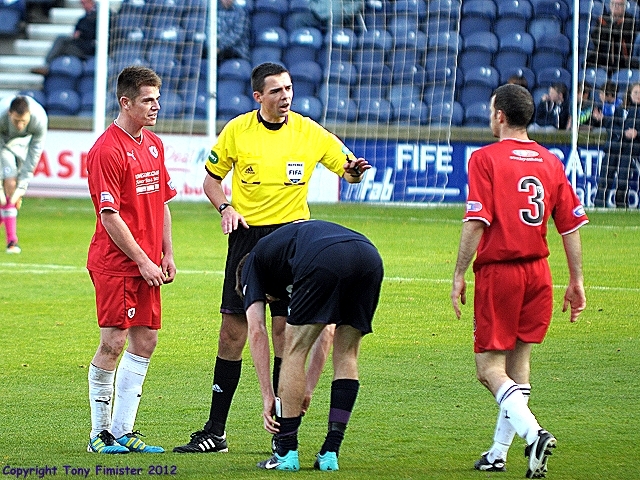 There was controversy just before the half hour mark when Erskine received the ball out wide on the left. 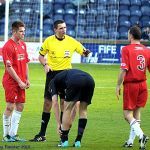 After jinking between both Mensing and Grant Anderson he was tripped up, and with most fans thinking the perpetrator had been Mensing the supporters in the home end were relieved to see Anderson was given the yellow card by referee Kevin Clancy. The game was starting to open up now. Firstly McGurn saved from close range from Elliot, then Rovers raced up the park and forced a corner from which Malone headed over when he could have done better. The crowd sensed that despite being second best in terms of possession, Rovers were just starting to get a toe hold in the game. Mensing fed Thomson on the right-wing who in turn laid it off to Grant Anderson. His clever turn allowed him to gallop into the box and faced with a lack of options he went for a near post shot that almost dipped in after Fox’s parry. From the resultant corner Partick got another let off. A poor clearance saw the ball swept back into the box but Spence and Graham just couldn’t get the vital touch and then Grant Anderson saw his effort at the back post blocked. The chance was the last action of a first half that had seen Partick at times play some great football, although Rovers had probably fashioned the more clear-cut opportunities. Partick tried their best to rectify that fact in the opening minute of the second half. A ball over the top saw the Raith defence caught out, allowing Bannigan a clear route to goal but his fierce drive was acrobatically kept out somehow by McGurn. Two minutes later the away side squandered another good chance. Some more great play from Erskine, Elliot and Lawless freed up Bannigan at the back post but he half volleyed the ball over despite being in time and space. Hill was then booked for a fairly innocent looking coming together of bodies mid way inside the Rovers half. The game began to get slightly scrappy with Partick struggling to find the fluency that they had in the first half while Raith were failing to gain any momentum at all. Their only chance of note in the opening spell of the second period fell to Walker who’s drive to the edge of the box was halted by an excellent challenge from Muirhead. Jackie McNamara made his first change on 56 minutes, Kris Doolan replacing Christie Elliot to the delight of the travelling fans who chanted the substitutes name as he ran onto the park. 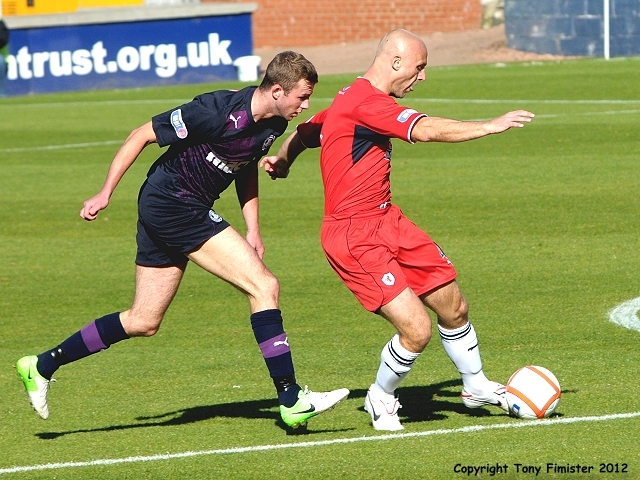 Erskine was as much a handful to the Rovers defence in the second half as he had been in the first. After 60 minutes he evaded 2 challenges before crossing to O’Donnell who had again found space at the back post but his headed finish was poor. The opening goal was looking more and more vital and probably just against the run of play, it was Rovers who grabbed it on 66 minutes. 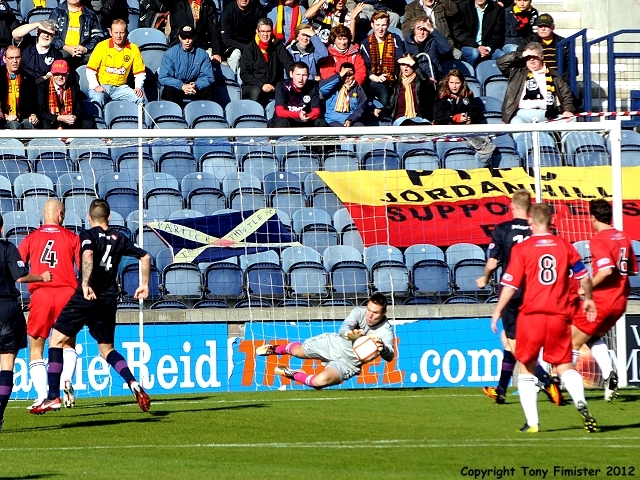 Grant Anderson attempted a first time cross into the box which didn’t trouble the Partick defence. However with Sinclair in possession inside the box he carelessly gave it away to Spence who turned and unleashed a fantastic drive past Fox to put Thistle behind in a league game for the first time this season. Rather than stir Partick into action the goal seemed to galvanise the home side, with only Scott Fox standing in the way of them extending their lead. First Graham teed up Grant Anderson but his shot was well held. Then with 12 minutes remaining a strong surge down the right from Thomson found Spence six yards out but his header was kept out, from the resulting stramash Graham somehow saw his effort go over from close range. Just a minute later Spence again was denied, this time from Fox’s fingertips after being set up by Graham. Grant Murray then made his first substitution, replacing Grant Anderson with Joe Hamill. With 8 minutes remaining McNamara made another change, replacing left back Sinclair with James Craigen. As the time ticked by Partick’s attacks became more insistent, but for all their possession and crosses McGurn wasn’t really tested until the clock approached 90 minutes, tipping a free kick over the bar just as it appeared to be dipping under it. found Partick with spare men at the back post and Doolan headed unchallenged past McGurn from six yards. The away fans danced in delight while the Partick players, almost to a man ran over to the dug out to celebrate with the management team. Whilst conceding such a late goal is always a bitter pill to take. Grant Murray can still take positives from the game. Despite coming up against a Partick side that had won 6 games in succession, Raith were seconds away from defeating them and although Partick played the better football, only a great performance from Fox after the first goal prevented Rovers from sealing the match. 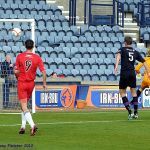 On an individual level Stuart Anderson was Raith’s best performer on the day and while Spence and Graham don’t yet have the understanding that’s shared by Graham and Clarke, there were signs in the second half that they were just beginning to click. With Dumbarton desperate for points when they visit Stark’s Park next week, Murray will again be hoping that the positives outweigh the negatives come the full-time whistle. Slight delay in the teams coming on the pitch. 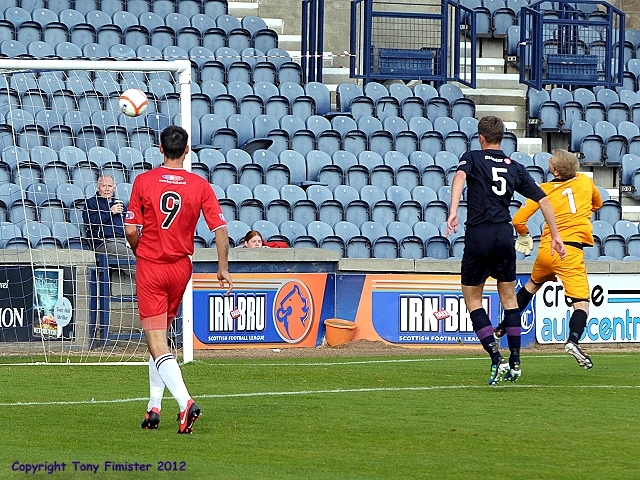 Raith shooting towards the South Stand. Malone cross into the box goes wide. S. Anderson wins the ball 30 yes out passes to Graham who shoots over the bar. McGurn saves low to his left from Paton. Patrick camped in the Raith half. McGurn saves a 6 harder from Paton. G. Anderson shot from 20 yes, parried by Fox for a corner. Hill heads wide from Walkers corner. Sinclair fires across the goal, but no takers. Free kick wide left, safely plucked out of the air by McGurn. McGurn saves a close range shot from Elliot. The ball goes quickly up the pitch for Malone to head over from 6 yes. G. Anderson tests Fox from close range, the resulting corner ricocheted of two Partick players and spins past Graham and Spence in the box. Brannigan shoots from an acute angle - McGurn pulls off a wonder save. Paton corner cleared behind by Mensing under pressure. Thomson run down the right. Spence causes havoc in the 6 yard box. Graham shoots over from close in. Raith Rovers, McGurn, Thompson, Malone, Mensing, Hill, S. Anderson, G. Anderson, Walker, Graham, Spence, Smith. Subs, Hamill, Ellis, Callachan, Donaldson, Laidlaw. Patrick, Fox, O'Donnell, Sinclair, Paton, Muirhead, Archibald, Lawless, Bannigan, Elliot, Murray, Erskine. How did it not go in ? But where's the ball ?